According to the DeLorean Owners Association, 8,583 DeLoreans were manufactured at the factory in Northern Ireland during the years 1981, 1982, and 1983. When the company was forced into bankruptcy in 1982, the unique looking car with the stainless steel body looked like it was on its way to being another footnote in automobile history. That was until director Robert Zemeckis chose the car to play the part of the Time Machine in the 1985’s Back to the Future, and the two subsequent sequels. 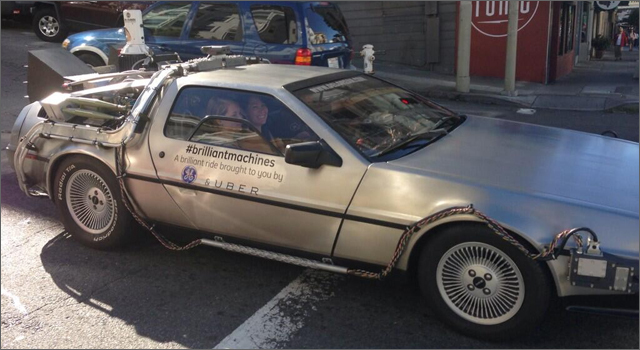 As part of GE’s ongoing Brilliant machine campaign, the company partnered with on-demand car service Uber for free 15-minute rides around San Fransisco-area this weekend in one-of-four time-machine outfitted Deloreon. To access a free ride, Uber-users had to watch for the option to pop-up on the mobile app. The rides were limited to 15 minutes and time-travel was not included.